Aaron Monheim, a barista at Revel 77, makes a cup of coffee. In the best way possible, you could say that Deb and Mike Nelson are obsessive. The pair — he’s 55, she’s 54 — makes lists for wherever they’re going: a list of the coffee shops they want to see and the restaurants where they want to eat. They’ve taken their coffee obsession into shops down the West Coast, from Fairbanks to San Diego. After Mike got the idea to open a coffee shop, he attended the American Barista Coffee School for a week last winter. Then, the Nelsons decided to bring their idea to life: a simple, stripped-down shop where coffee is king. Not pumpkin or eggnog or peppermint — just coffee. Like the craftsmen at Coeur Coffeehouse and Indaba Coffee, Revel 77 concentrates its menu on doing just a few things really well. Like a pub that rotates its taps, the Nelsons’ menu features three different espressos at all times from three different Northwest roasters: Water Avenue, Victrola and locals DOMA Coffee. A cup of simple espresso is $2.70, or a flight of all three is $4. Flavored lattes are punched-up with flavors the Nelsons make themselves: vanilla, chocolate, salted caramel. They make their own sodas, too — on our visit, a savory and spicy orange clove soda was loaded in the fancy fountain behind the bar ($2.50). The classic menu is enough to draw coffee connoisseurs, but Revel 77’s space will take just about anyone’s breath away: fusing the feel of an art gallery with that of an industrial warehouse. A gigantic LED sign that reads “REVEL” in bright white letters hangs from the ceiling. Black wood ruts carve lines across the walls, white tables and eggshell blue plastic chairs stand in rows along the walls, and a metal-topped community table runs down the middle of the room. It’s a stunning place, designed by Hissong+Hurtado Design Group — who also refined the looks of Savory, Top of India and Wasabi. Mike says they’ve got big plans to add an outdoor patio in the spring and bike racks to catch the cyclists on 57th. 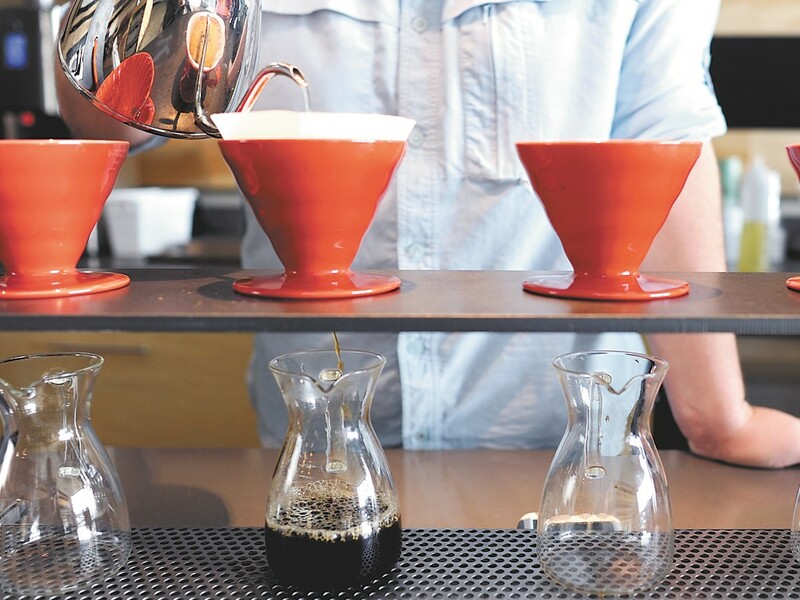 They’ll also host coffee cuppings and monthly coffee art throwdowns. Mike, who makes espresso for customers alongside his tattooed baristas, might even join in too. Deb looks at her husband proudly “He can pour down pretty good,” she says. He protests for a second, then just smiles.